In OroCommerce, a workflow is a business process that involves multiple user interactions or sequential phases. It may trigger other workflows and change the status of the items involved in a business process. In the storefront, workflows organize and direct users’ work (e.g. during the checkout), making them follow particular steps in a pre-defined order (e.g. provide shipping address, then select shipping method from the options supported for the destination), or preventing them from performing actions that either contradict or conflict with the logical steps of a process (e.g. a customer may not be able to submit an order without their manager’s approval). In the OroCommerce management console, workflows help users follow standard procedures that may be of a non-linear nature with alternating flow that depends on the available information, related items status, connectivity with integrated solutions, etc. In Oro applications, any workflow may be classified as either system or custom. System workflows are provided out of the box. Their modification is limited in order to keep core functionality operational. However, if you create a Custom workflow from scratch, you can tailor it for your needs without any restrictions. For more information on system and custom workflows, see System Workflows and Custom Workflows. Transitions that take a user from one state to another and connect to each step in the workflow. Self-transitions that do not change steps in the workflow. Every workflow has the Start transition that launches the workflow. A transition can be defined as soon as there is at least one step besides Start. However, it is often simpler to define all workflow steps and then all the transitions between them. Attributes are characteristics of the record. For example, a ZIP code and a street name are attributes of an address. In the course of each transition, you can change some attributes of the processed record. A workflow may have configuration parameters (also known as variables). For example, the Alternative Checkout workflow includes reviewing of an order by an authorized person. This is usually required only for orders exceeding a certain amount, so the workflow’s configuration parameter enables you to set an order subtotal limit that triggers the alternative checkout. If enabled (see the section below), the workflow widget displays the process steps defined in workflow configuration on the record view page. Multiple workflow widgets can be displayed for one record at the same time. Click Create Workflow on the top right of the page. On the Create Workflow page, specify the details of your workflow in the General section. Once the details in the General section have been specified, add steps and transitions in the Designer section. Name The name of the workflow. Related Entity A related entity is the entity for which the workflow is created. When the workflow is active, it can be launched and executed on the records of its related entity. Exclusive Active Groups Exclusive Active Groups is a list of group names for which the current workflow should be active exclusively. Determining Exclusive Record Groups allows to set up mutually exclusive workflows in order to configure how they each correlate in the system. This makes it possible for only one workflow to be active, or for an entity record to use only one workflow from the group at a time. Exclusive Record Groups Exclusive Record Groups specify how workflows apply to certain sets of records in order to limit their applicability. This lets users create specific workflows for specific segments (subsets) of records. For example, no concurrent transitions are possible among workflows in same exclusive record group. Default Step Specifying the default steps launches the workflow in a particular step by default. For instance, when you activate Opportunity Management Flow, a newly created opportunity will appear as open, if open was specified as the default step. If no step is selected, all newly created records will have no workflow associated with them, and it must be launched with one of the starting transitions. Display Steps Ordered box is not checked by default. If checked, all workflow steps are displayed in the workflow widget. If not checked, only the steps that have actually been performed are displayed. The Designer section consists of a table and an interactive chart representations of a workflow. Update (clicking the transition name opens the Edit Transition form). Clone (clicking the Clone icon next to the transition name opens the Clone Transition dialog). Delete (clicking the Delete icon next to the transition launches name Delete Confirmation dialog). 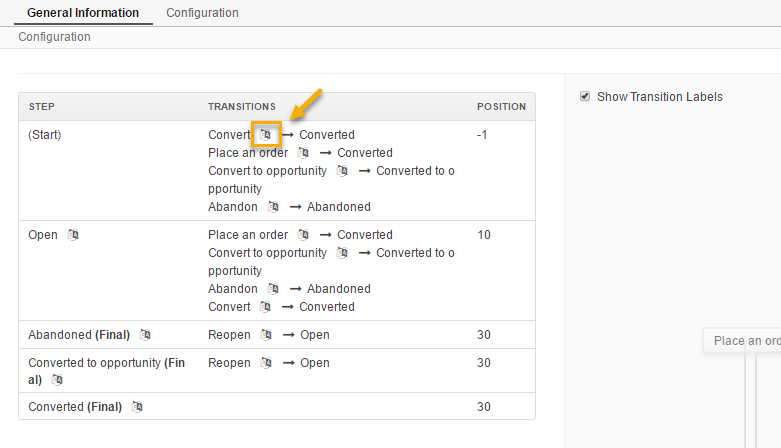 Add a transition to a step (clicking the + icon opens the Add New Transition dialog). Update (clicking the Edit icon opens the Edit Step dialog). Clone (clicking the Clone icon opens the Clone Step dialog). Delete (clicking the Delete icon launches the Delete Confirmation dialog). Add a transition (clicking the + Add Transition button at the top of the chart opens the Add Transition dialog). Add a step (clicking the + Add Step button at the top of the chart opens the Add Step dialog). Autosort (clicking the Auto Sort button at the top of the chart automatically shapes your chart). Rearrange the chart for clearer workflow view (drag-and-drop transitions and steps in the chart as required, or click the Expand button in the top right corner of the chart). Zoom in/out (click the Zoom In / Zoom Out button in the top right corner of the chart to zoom the chart in/out, or select zoom percent from the list). Show transition labels (select this check box in the top left corner of the chart to display transition labels in the chart). Drag transitions from one step to another (point to one of four corners of the step box, and when the cursor changes shape to the hand, click the corner and drag an arrow to another step). Undo/Redo changes (click the Undo / Redo button at the top of the cart to revert or restore changes made to the chart). Edit/Clone/Delete a step/transition (point to the step/transition button, and when the arrow appears, click it, and then click the Edit / Clone / Delete icon. 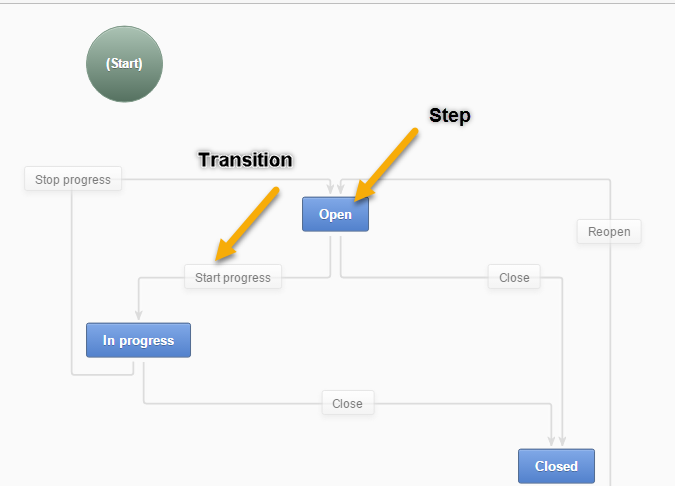 All actions available for transitions and steps in the table are available in the chart as well. As an example, we are going to create the Opportunity Support Flow workflow to show how a workflow is configured and visualized. Click Add Step in the top right corner of the chart. Name The name of the step that will be displayed on the entity record. Position A number that determines the position of the step in the workflow. The higher the number, the further the step is from the start. Final This option marks the step as the logical end or the outcome of the workflow. This is a purely logical property required for distinguishing steps for the funnel charts or creating reports with the workflow data. Marking the step final has no effect on the flow itself. Click Apply to save the step. Next, we are going to apply a transition for these steps. For the sample Opportunity Support Flow, we will start off by creating two steps: No Complaints and Complaint Received. Click Add Transition on the top right of the chart. Name The name of the transition that will be displayed on its button. From Step The workflow step, for which the transition button should appear on the entity page. To Step The step to which the workflow will progress after the transition is performed. View Form Transition attributes can appear in one of two available forms: in the popup window, which is a default transition behavior suitable for most cases, or on the separate page, which should be used with care and only for attribute-heavy transitions. Warning Message If you want to show a warning popup message to the user before a transition is executed, put the text of the warning into this field. Button Label This text appears on the transition button and as the title of the transition form. If the button label is not provided, the value of the Name field is used. Button Title This message appears when a user moves the pointer over the transition button. Use it to provide transition description or any other additional information. Button Icon An icon that will appear on the transition button before the transition name. Button Style This control specifies the visual style of the transition button. This is the live preview of the transition button as it will appear on the entity page. Self-transitions do not change steps in workflows (e.g. it can be a transition that launches an Edit form of a record within the same step). Entity Field This is the field of the workflow entity or its related entities that will appear on the view form of the transition. Use these if you want a user to add or edit some entity data in the transition. Label Use the field if you want to change the way it is displayed on the user interface. The system label value of the entity is used by default. Required Select the Required check box if the definition of the attribute should be mandatory for the transition. +Add Click +Add to add a new attribute. Click Apply to save the transition. From the Entity list, select the same entity as you have selected for your workflow. From the Event Name list, select Workflow transition. From the Workflow list, select your workflow. From the Transition list, select the transition about which you want to notify concerned parties. All other fields must be configured as usual. The following is an example of an attribute added for the Register a Complaint transition in the sample Opportunity Support Flow. The entity selected for the attribute is Additional Comments. Its label has been changed to Specify the Complaint. In the same manner, specify steps, transitions and attributes required for your custom workflow. In the main menu, navigate System > Workflows. On the workflow list, click the required workflow. If the workflow has configuration parameters, you can see the Configuration button on the top right of the workflow view page. Click this button. On the workflow configuration page, set the required values to the configuration parameters. You cannot create new or delete existing configuration parameters via the user interface. See User Interface Limitations section. When you clone a workflow, pay attention that configuration parameters are cloned too and cannot be removed from the cloned item. Transition buttons will be displayed on the top right of the entity record page. All the steps will be located on the top right of the entity record page within the workflow widget. The sample Opportunity Support Flow has been saved and activated. Submitting a complaint will launch an opportunity page with the Resolve, Request Feedback and Close transition buttons activated. The workflow widget now displays only the current step that the opportunity is in. View: (Go to the view page of the workflow). Activate/Deactivate: / (activate/deactivate the workflow). In case you need to alter a system workflow, clone it via the command line console under the different name and make the required changes. For more information on how to clone a workflow, see How to Clone a Workflow. Clone: (copy the workflow to be able to customize it). Edit: (open the edit form of the workflow). Delete: (delete the workflow from the system). Via the user interface, as explained in the Create a Workflow section above. In the command line console, by loading the workflow configuration files and related translations. Usually, it takes a system integrator with access to your Oro deployment to create a workflow in the command line. Some workflow components, like an email notification, may be created only via the command line. 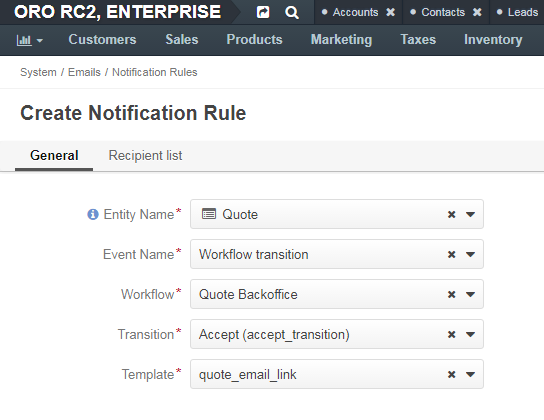 In the user interface, you cannot edit or clone workflows that contain transition actions and conditions. If you need to clone a workflow anyway, see How to clone a wokflow via the command line console. For how to create and manage workflows from the server side, see Workflow Documentation in the oroinc/platform repository on GitHub. Optionally, you can select certain workflows to be deactivated. If you do not, leave the field empty and click Activate. It is possible to activate/deactivate workflows from the grid. See the previous section of this guide on Workflow Management to learn more about workflow grids. Visibility of the entire workflow and its steps/current step. Ability to run workflow transactions. Ability to run every individual transaction. All workflow labels can be translated into other languages, providing better localizations for users from different countries. Click the To Translations icon next to the label that you want to translate. The translations list opens and is filtered to show only relevant translations. From the translation list, choose the language into which you want to translate the label, and point to the corresponding cell in the Translated Value column. Using the inline editor, specify the new translation for the label.